Spinnerette Biography, Discography, Music News on 100 XR - The Net's #1 Rock Station!!! Spinnerette, is the Alternative-Rock Punk-Rock project from former The Distillers singer + guitarist Brody Dalle. 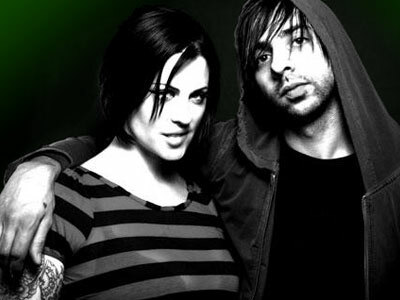 After the split of The Distillers, Dalle started working on Spinnerette in Los Angeles, California USA, with Tony Bevilacqua -- AKA Tony Bradley -- a fellow member of The Distillers, Queens Of The Stone Age bass player Alain Johannes and Jack Irons, the former drummer of The Red Hot Chili Peppers. In December 2008, the band released electronically a four-song EP entitled "Ghetto Love", in advance of their debut album which arrived in mid-2009 and peaked at #41 on Top Independent Albums album chart. Two singles off the disc, "Ghetto Love" and "Baptized By Fire", were heavily played on 100 XR. In May 2014 Brody Dalle released her first solo album, "Diploid Love".